What are your thoughts on 'Roids. Have you ever done them? It seems most everyone I know has done them at some point except myself. My wife and I over the last year and some change have become very health and fitness oriented. I will be honest, getting rid of love handles is ridiculous. 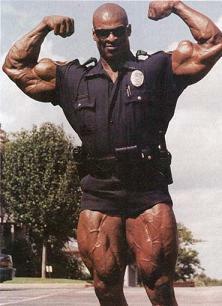 Is there an over the counter legal product I can take that will have somewhat of a 'roid effect. As you can imagine my wife is way against 'roids. Just thought I would pick your brain if you had a minute. I'm posting this because I have gotten asked this question a thousand times over the years, some people joking but a lot of people being completely serious. This is a completely blunt and honest reply as well. I'm proud and lucky to say that I have never used 'roids, HGH, Andro, DHEA, clenbuterol, IGF-1, or any other similar drugs. I say "lucky" because despite my time spent in the gym and with athletes/sports teams, it has never really come up. Nobody has ever offered to "shoot me up" or sell me steroids, I've never witnessed anybody taking steroids, and I've never tried to order them myself. I've talked to a few casual friends and acquaintances in college that talked about their steroid and clenbuterol use, but that was about it. I am very lucky because I also know a lot of people that were obviously taking steroids and hgh, talked with them all the time at the gym or trained with them, but never were in their "circle of trust". I know this sounds stupid, but it's a very secretive subculture of steroid users and dealers, especially since it has become a very illegal drug that will get you arrested on par with heroin or cocaine. Now I'm a short guy (5'5") and I've always been into getting bigger and stronger so if I was ever offered the drugs, especially in college and other weak moments, I probably would've tried them. 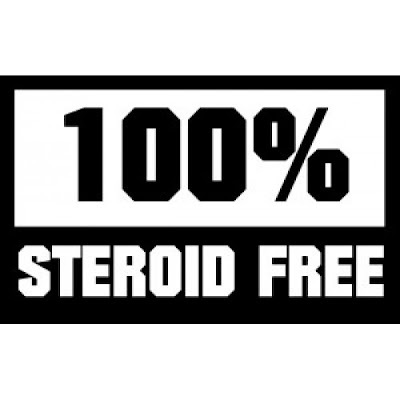 I have enough problems though without adding the physical and mental complications of steroids use and similar compounds so that would have been a terrible experiment in many ways. I don't judge a lot of people who take steroids because people take them for different reasons, have different genes and psychological capacities, and training goals. 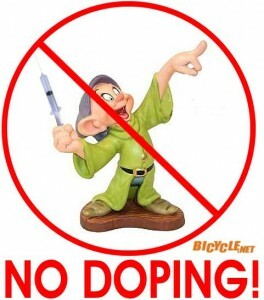 I don't necessarily judge many professional athletes that take performance enhancing drugs because they can help them prolong their career in a sport that they love or add a few extra million dollars to their payroll. I don't judge bodybuilders and powerlifters that take them because that is part of the sport and culture. BUT WHEN IT COMES TO A RISK : REWARD ANALYSIS, TAKING STEROIDS IS A BAD IDEA FOR MOST PEOPLE AND I WOULD NEVER RECOMMEND IT. 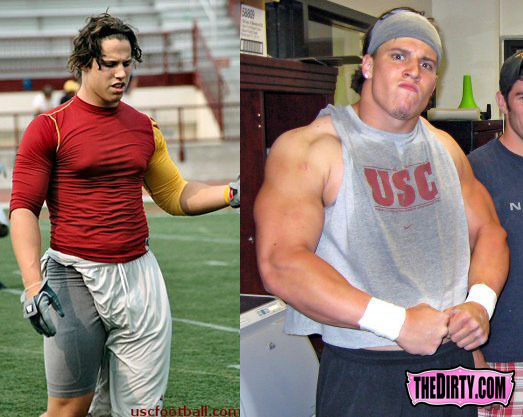 Most people aren't going to make millions of dollars from a few cycles of steroids. Even these professional athletes and bodybuilders I speak of are simply trading increased performance NOW for decreased health and performance LATER. 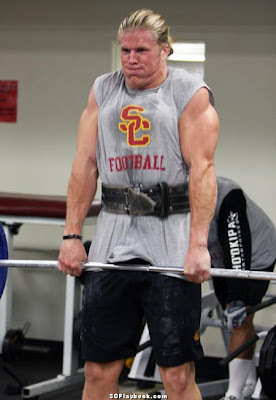 They may improve their physique and performance for a few years but down the road they will suffer liver failure, heart disease, gynecomastia, kidney failure, low testosterone, depression, and much more. The short term and long term risks are far too high to warrant an average person taking these drugs. 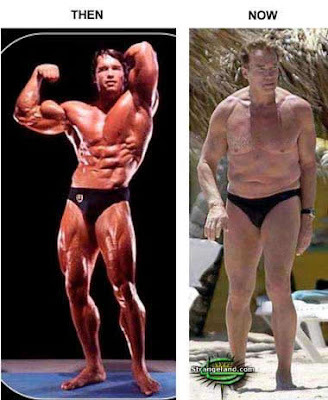 By the way, I hate to show these pictures since I love Arnold. 35 years of difference, and several careers in between. You'll see plenty of close-ups of Clay Matthews' Biceps in this year's Superbowl! 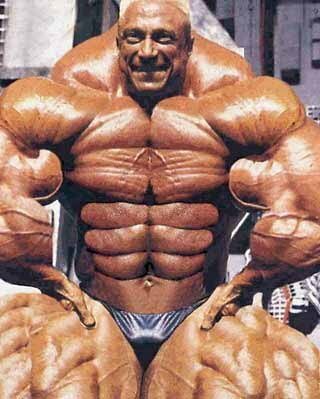 Your wife is right to be against "roids" and I would recommend you opt for the safer, healthier, and natural way of reducing bodyfat and increasing muscle. Unfortunately that means hard work, lots of cardio, and healthy eating. Men's metabolism and natural testosterone production decreases after mid-to-late 20's, so it will be more of an uphill battle. But I've seen natural bodybuilders and athletes in their 40's and 50's with incredible physiques and strength so it can be done. It just requires a world of discipline and work. Good luck and stay natural! I'm glad I have, or I might not be here today. I might be in jail or dead. A chilling thought but true.